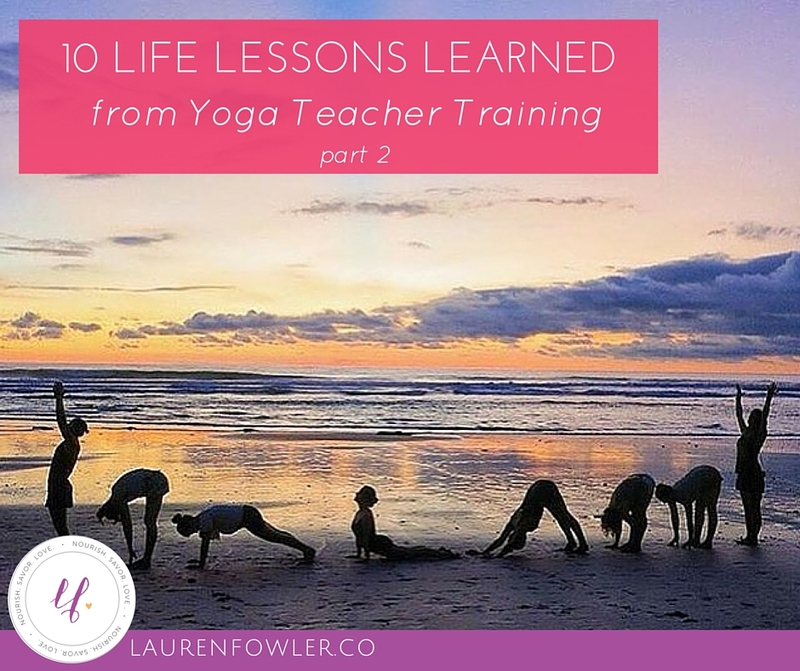 I'm back with part 2 of lessons learned from my yoga teacher training, as it was turning into one massive post! If there's any interest, I'm happy to share more about my training! I've also found it so therapeutic to write about my experience and really what a transformative month it was for me. 6. Yoga has ripple effects. Yoga can feel really, really good in the body. Depending on the practice, you may feel strong, confident, powerful, calm, relaxed, blissed out, or all of the above. You may start to feel that connection between your mind, body, heart, and intuition. When your body feels good, it often leads to wanting to take care of your body in other ways. You feel the effects of a physical practice - a clear mind, more energized, feeling good in your body, better sleep, reduced anxiety. Many people start to naturally eat more nourishing foods or view food in a different mindset because they want to take care of their bodies. For me, that month in training, I felt so much mental clarity from doing yoga every morning outside. It felt much easier to hear my voice of intuition as well because my body was physically nourished and energized. I don't need as much stuff as I think I need. I was completely content wearing sports bras and shorts on a daily basis that were never really clean, living in a treehouse with 10 amazing women, and eating simple but delicious plant-based meals. My environment makes a huge difference to my mood and wellbeing, and being surrounded by jungle and watching daily sunsets at the beach filled me with so much joy. Although I have cut back on tons of my clothes and stuff in my house (I love the book The Life-Changing Magic of Tidying Up), I still don't need most of it. It's a gentle reminder to myself that it's nature, relationships, sunsets, cuddles, animals, writing, yoga, and more that fill me with more joy than new clothes or a perfectly furnished house. That's simply my values - other people will find so much happiness in a carefully crafted closet or house. At times, I love getting dressed up to go out too, but most of the time, I'm happy in yoga clothes and exploring nature. One thing that I really missed while I was away was a hot shower though! It was an amazing feeling to take a long hot shower - and feel truly clean - after a month in the jungle and a day of traveling on buses, ferries, and planes. 8. Surround yourself with amazing people. Relationships and connections make all the difference. I couldn't have imagined doing my teacher training with any other group of women. One thing I really appreciated about my program was there were only 10 women, so we all had the chance to connect and get to know each other quite well, pretty quickly. Anytime I've been in intensive programs surrounded by people nearly all day for weeks, I've created some amazing friendships - both in my teacher training program and working at a summer camp in college. The nature of a YTT is intensive emotionally, so we had plenty of group time sharing our personal fears and vulnerabilities, big dreams, listening to each other, and holding space for each other to share their stories. A few of us would make tea every night and have chats (or sometimes just venting), and it really helped us make it through the program. The sisterhood we created was strong, and that's the type of connections I want in my life:Real, authentic, honest, vulnerable. It's so easy to hide your vulnerabilities and pretend that you're "fine," but know that everyone is going through some kind of struggle. Sharing your story allows a deep connection to grow. It's an act of courage to be vulnerable, so give yourself patience and love as you start to share your fears or dreams. 9. Speak in YOUR Voice. One thing we talked a lot about was our "yoga teacher voice." This doesn't mean switch into yoga teacher mode by making your voice sound soothing or using cues that aren't really you. 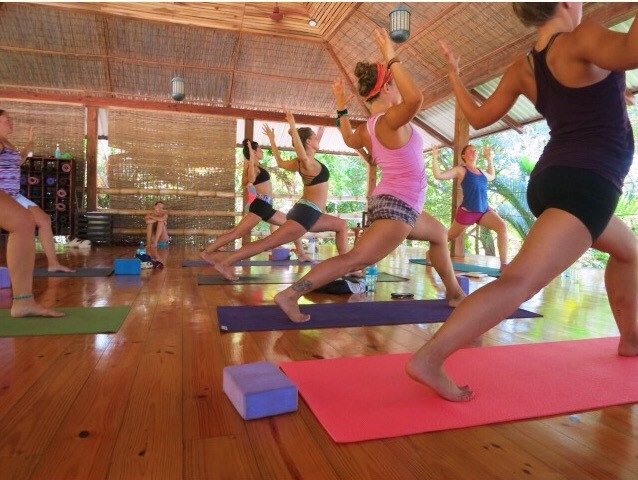 Your yoga teacher voice should be YOU - you should infuse your classes with your own words, cues, and personality. My training was a vinyasa training, so there's opportunity to create creative, unique flows (some styles of yoga like Bikram are the same, regardless of the studio or teacher). That's what I love about yoga - I have the chance to grow as a yoga teacher, to find my voice, and create classes that include my personality. I have the opportunity to use my voice and express myself - a continual intention for me - so I don't drain my energy being someone that I'm not. This is exactly why I don't talk about weight loss on this blog or with my clients (and won't teaching yoga classes either). It's why I share about intuitive eating, health at every size, body acceptance, and the immense importance of self-care. There are plenty of awesome people writing about these topics out there, and there are tons of amazing yoga teachers. Yet, none of them are speaking in my voice because my voice is unique to me. I have a message to share, and I'm going to share it through writing here, coaching clients, and teaching yoga. Even writing these words is giving me a fluttering sensation in my heart because sharing my truth comes from my heart. This is truth off the mat too - do you turn into a different person at work vs at home? How can you practice being authentic to yourself in all areas of your life? When I signed up for my YTT, people asked me why I didn't do it locally. To be honest, why would I do it locally taking up my weekends when I could spend a month in Costa Rica? I knew I wanted to do it as an intensive program - surrounded by nature - and immersing myself completely in the program. Nature has always felt like home for me. I'm happiest outside, so living in a jungle near the beach was so therapeutic and healing for me. I thrive in sunshine, and while I like the snow to snowboard (all bundled up), I can't say I'm a huge fan of being cold. I had the deepest savasanas of my life in Costa Rica - on a platform in the jungle, covered myself in sand practicing on the beach, and wildlife was my playlist for that month. Luckily, I also live in a beautiful state covered in mountains. Chakras are cool. So is anatomy. You can find alignment and balance in so many forms! Mirroring the class is one of the hardest things to learn! Since you teach facing the class, the teacher has to remember to step the left leg back when cuing the class to step the right leg back. That way, the class sees the teacher doing the same thing as them and isn't confused by doing the opposite side.